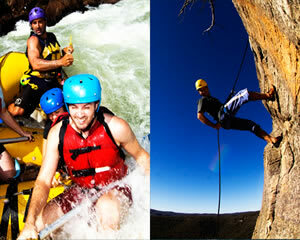 White Water Rafting Adventures At Adrenaline - For The Thrill-Seekers! Australia is blessed with an abundance of seas, surging waterways and rivers teeming with wild poetry and possibilities for thrill-seeking adventures. 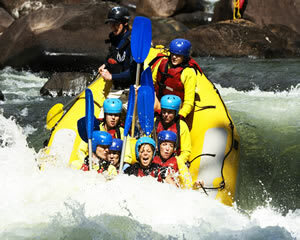 White-water rafting is one such sport that makes a splash and also an exhilarating rush to remember. Adrenaline has the means and spectacular locations to embrace a keen sense of team-spirited thrills and spills in white-water rafting experiences. The most invigorating and also safest rafting trips amid tranquil and breathtaking scenic surrounds are guaranteed to inject a spirit of high adventure and immense natural beauty. White water rapids are graded in ascending order from one to five, in terms of the implicit challenges for rafting teams. 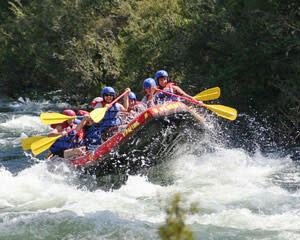 A grade five rapid is the most advanced ranking for a commercial rafting group. Adrenaline provides the expert know how and, as such, your experienced rafting guide will impart all the tuition and vital ins and outs for you to gain the most from your day spent dominating the river, regardless of difficulty levels. Master its ebb and flow with a full safety briefing, including paddling techniques, what to do if you fall out of your raft and how to make the ultimate splash against other teams in the white-water rafting battle ground. 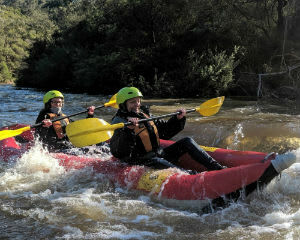 Even though Adrenaline takes this rugged adventure activity very seriously, all packages and experiences, from half-day trips to a 10-day rafting expedition, are designed for maximum fun and the ultimate white-water wow factor. 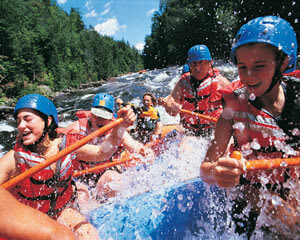 Where is the best place for white water rafting? From the gushing tropical rivers in Cairns to the coastal beauty of Coffs Harbour, mesmerising Sydney Harbour and its innumerable inlets, Adrenaline provides the perfect place for rafting tours and trips at the best prices. 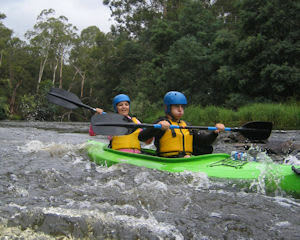 The White Water Kayaking, Full Day trip at Barrington River in Gloucester, NSW, is a popular spot for adventure and scenic splendour. Even the most inexperienced paddlers can enjoy a full day of fun on the water. This package includes all equipment, an experienced instructor on hand to show you the ropes and guide you every step of the way. The day trip comes complete with a gourmet lunch and afternoon tea. Not only resplendent in natural beauty, but the Barrington River is also renowned for its challenging twists and turns in the rapids. Just let your guide know how far you want to take this experience and he or she will show you the way. 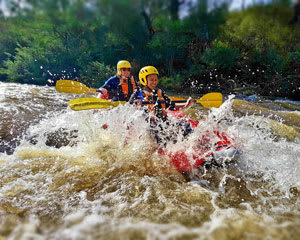 When in the tropical north, the White Water Rafting Xtreme Tully River One Day Tour in Cairns has been custom made for the more experienced rafter. This unforgettable rafting adventure accepts only small groups for quicker travel and further reach. You and your team will traverse 12km, entailing taking on 44 rapids in fast action, along the stretches of the Tully River. As you ride the rapids, you will also encounter World Heritage-listed rainforest and waterfalls that cascade down the spectacular gorge walls. The Tully River is rated moderate to challenging, providing grades three and four levels for white-water rafters. Your trained guides will impart all the tuition you need to make the most of your five hours of high adventure on the rapids. 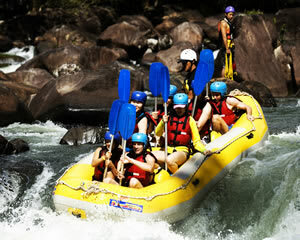 Adrenaline also offers full-day tours in Cairns that include ATV and White Water Rafting. This action-packed experience involves riding through the dirt tracks and creek crossings of the rainforest on your quad bike. You will be at one with nature at its breathtaking best before surfing the waves and drops, with a dynamic white-water-rafting adventure through the Barron Gorge. 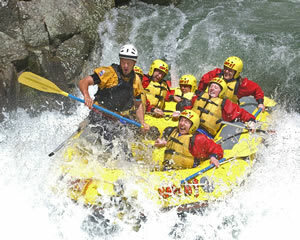 White-water rafting is an extremely physical water sport and there is potential for the raft to flip. But the highly trained guides at Adrenaline will have the team back in the boat, and high and dry, in no time. Not all rafting experiences offered are of the white-knuckle variety. Adrenaline provides a range of packages for mellower conditions amid the most tranquil scenery. You should simply feel free to go with flow. Your rafting guide provides full safety briefings prior to every white-water rafting tour with Adrenaline, so that even if there are occasional spills, you’ll be back in paddling action before you know it. What are the do(s) and don’t(s) regarding white-water rafting? The most important to do on this list is to listen to your guide at all times. He or she is professionally trained, with years of invaluable rafting experience. When they give the command to paddle, you should follow suit, unless your aim is for an unexpected dip in the water! Prior to your white-water rafting adventure, it is also critical that you’re aware of what you’re getting yourself into, and this does not mean deep water. Rafting trips provided by Adrenaline are geared towards all experience levels, so it’s important that you choose the right rafting adventure for you and your group. Equally crucial on the don’t list is to not let go of the top section of the paddle grip, which is called the T Grip. This is especially important when you are approaching a rapid because if one of the team lets go of the T Grip, it could end up in the face of another team member, which can cause serious injury. The best all-round advice for white-water rafters is not to panic. Your expert guide will provide a full briefing of what to do, should you fall into the river. Listen carefully to their instructions and in the event that you do land in the water, look to your Adrenaline guide as they guide you calmly and safely back into the raft and successfully completing your exhilarating adventure.